This manual operation projection screens features a internal Auto-Locking System: simply pull the screen and it will stay put. Fully black backed front projection screen with 1" side black borders. Mildew resistant, durable, and easy to clean with soap and water. Manual projector screen features an auto locking mechanism to provide variable height settings and prolonged operational lifespan. HD Matte White Fabric not only provides a wide viewing angle with perfect diffusion uniformity but also retains precise definition, image color reproduction and black/white contrast for a beautifully crisp picture. Manual Screen designed for wall and ceiling installation. The screen is rolled in a sturdy steel case that can easily flush mount to your wall or hangs your ceiling or brackets. Features a 2-inch internal auto-lock mechanism that allow for various height settings and Slow Retracting Mechanism for a safe and secure return when no longer in use. HD matte white screen material is the most versatile screen surface for front projection presentations, This material provides the widest viewer angles with perfect image color. 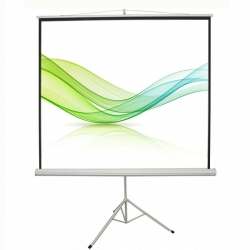 Manual Projector Screens is not recommended for Short Throw or Ultra-Short Throw Projectors.